Audrey loves trying new foods. Her favourite thing to eat is nachos with melted cheese, guacamole and spicy salsa. Florence is a great singer and loves music. She is learning to play the piano and practises every day. Sprinkles and Twinkles are brilliant at baking cakes. They like to do everything together. 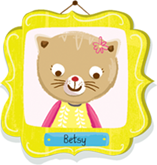 Betsy is kind and funny. Her favourite colour is yellow. Doris likes going on adventures. She collects postcards from everywhere she visits and always takes lots of photographs for her scrapbook. Fred enjoys playing outside in the sunshine, especially climbing trees and building dens. If it’s windy, he likes to fly his kite. Billy is great at telling jokes. He is always riding his bike around and sometimes he even roller skates! Lily is quiet and shy but she loves to dance, especially when she gets to choose clothes from the dressing-up box. She likes wearing tutus best. Mia is friendly and is a very fast swimmer! She likes doing handstands and roly-polys and can even touch her toes! 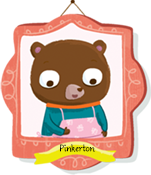 Pinkerton is very generous and warm-hearted. His favourite place to visit is the seaside because he likes paddling in the sea. 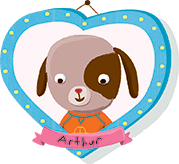 Arthur loves going to the library to choose his bedtime stories. Most of all he likes funny books, but sometimes he picks fairy tales, too. Born in Hong Kong and raised in Philadelphia, Jannie studied at Parsons School of Design in New York, earning a BFA in illustration. After working as a graphic designer and an art director at many fun places such as Nickelodeon, Scholastic, and TIME Magazine for Kids, she decided that illustration was her true calling. 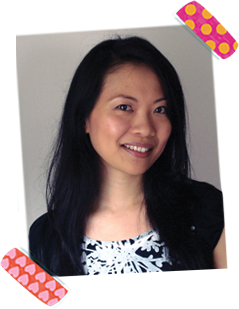 Jannie (also known as Chicken Girl) now specializes in illustrating for the children’s market, with her work appearing in both trade and educational books, magazines, toys, crafts and digital media. She currently works and plays with her husband and daughter in Boston, MA. 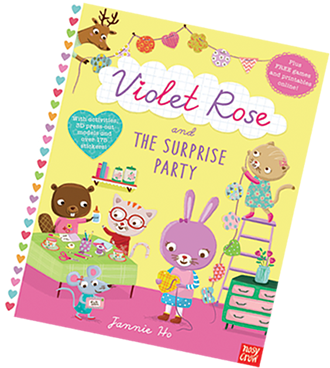 When busy rabbit, Violet Rose, discovers that her friend Lily has a birthday coming up, she and her buddies decide to throw a surprise party. From helping deliver invitations, to decorating Lily’s birthday cake, you can join in the party preparations. With stickers, press-out cards and activities on every page, this is a delightful and unique book that will inspire crafty kids who like a story. Creativity without the mess! 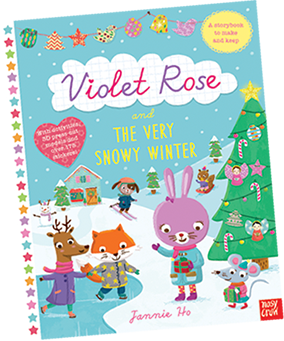 Winter is such a busy time for Violet Rose and there’s lots of snowy fun to be had! Can you help to make the Christmas cards, decorate the tree, get gifts to all the right people, AND prepare a Christmas feast? With 3D press-out models and over 175 stickers, there’s just so much to do in this delightful activity book. Keep creative kids busy with no mess and no fuss! 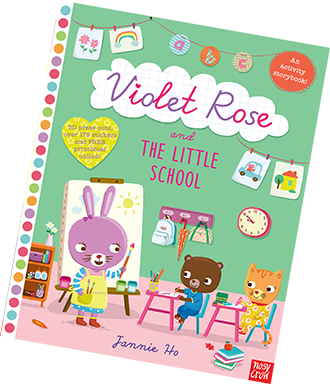 Violet Rose has a brand new job as the teacher of the Sunnyville nursery school. They’ve got a very busy week ahead – join in as Violet teaches the children about the life cycle of a butterfly, the seven continents of the world, telling the time… and there’s even a school trip!